Having taken July and August on a relative breather – not so much for his own downtime, but to give everyone else a break – for the third year running, the Pope has started September with a bang. This time around, though, the subtext is even keener than usual, with the initial flurry coming three weeks before Francis' arrival in the US, where one of the most significant moments of his 30-month pontificate awaits. Even before the first of the month, Papa Bergoglio laid down his opening marker for the Stateside tour yesterday, holding a surprise "virtual audience" with representatives of his beloved "peripheries" – migrants, the poor and homeless – in Los Angeles, Chicago and McAllen, Texas. Meanwhile, this morning saw another bolt from the blue with the release of a papal letter detailing some initiatives for the coming extraordinary Holy Year of Mercy, which Francis will open on 8 December – the 50th anniversary of Vatican II's close – as a time to reiterate that, as he put it earlier this year, "the church is the house that welcomes all and refuses no one." Though the initiative's full programmatic impact is only expected to emerge after next month's climactic Synod on the Family as the Pope decides on the gathering's proposals for fine-tuning the pastoral care of the faithful in challenging situations vis á vis church teaching, today's missive – addressed to the observance's lead coordinator, Archbishop Rino Fisichella – immediately sparked misleading headlines on the perennial third-rail of the church's response to abortion given Francis' decision "to concede to all priests for the Jubilee Year the discretion to absolve of the sin of abortion those who have procured it and who, with contrite heart, seek forgiveness for it." 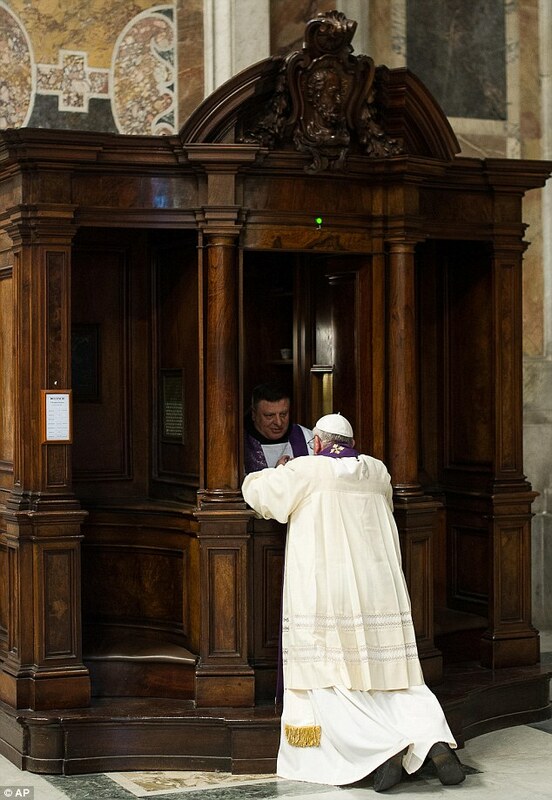 Yet again underscoring the centrality of the Confessional in his spirituality – and his ceaseless urging of everyone (himself included) toward it – Francis wrote that "the forgiveness of God cannot be denied to one who has repented, especially when that person approaches the Sacrament of Confession with a sincere heart in order to obtain reconciliation with the Father." To be sure, the text doesn't mention the canonical penalties attached to the procuring of an abortion, but – much like the recently-announced, yet still to be constituted CDF tribunal for abuse of office by bishops – is likely to be backed up with juridical guidelines in due course. As implications go, the move as understood would merely extend on a universal level what's long been standard practice across North America (albeit not in Europe): namely, that while the lifting of the latae sententiae (automatic) excommunication for a woman who obtains an abortion and those directly involved in the procedure is reserved in canon law to the bishop of the place to underscore the severity of the act, the faculty to release from the penalty over and above the sin itself is already delegated on a "blanket" basis to practically every priest hearing confessions in the US and Canada (and likely well beyond) and has been for decades. In other words, the much-touted "shift" is something long in place across much of the Catholic world, and is only being extended to wherever it doesn't already exist by simple fiat of the local bishop. On another front, some coverage has erroneously indicated that the excommunication for abortion will no longer be in force – a move that, in the theoretical sense, would be fully within Francis' purview to enact as the church's supreme legislator. At least as things stand, though, no dice there, either – to abolish the penalty would require a formal decree from him to abrogate (i.e. remove) Canon 1398 from the Code. As an important qualifier to all this, it bears emphatic reminding that for a latae sententiae excommunication on any grounds to take effect, the person committing the act must be fully cognizant of its legal consequences. Yet as Francis himself explained today, that's often, even usually, not the case: "the tragedy of abortion is experienced by some with a superficial awareness, as if not realizing the extreme harm that such an act entails. Many others, on the other hand, although experiencing this moment as a defeat, believe that they have no other option. "I think in particular of all the women who have resorted to abortion," he wrote. "I am well aware of the pressure that has led them to this decision. I know that it is an existential and moral ordeal. I have met so many women who bear in their heart the scar of this agonizing and painful decision. What has happened is profoundly unjust; yet only understanding the truth of it can enable one not to lose hope." In addition to the provision on abortion, the Pope opened another significant avenue to express his intent that "this Jubilee Year of Mercy excludes no one." In a remarkable opening for the priests of the traditionalist Society of St Pius X – who, despite being validly ordained, are suspended due to their leadership's ongoing refusal of communion with the Roman pontiff – Francis "establish[ed] that those who during the Holy Year of Mercy approach these priests... to celebrate the Sacrament of Reconciliation shall validly and licitly receive the absolution of their sins." For his part, the Pope said the move sprung from his concern for "those faithful who for various reasons choose" to attend SSPX chapels, a group estimated at around a million worldwide. With now-Pope-emeritus Benedict's controversial push to heal the major schism of the post-Vatican II church largely having stalled over the Swiss-based Society's reluctance to accept the Council's declarations on religious liberty and interfaith dialogue, whether the open hand from Francis – whose freewheeling style has often stoked fury among traditionalists – accomplishes progress toward an eventual reunion is anyone's guess. All that said, far from the hot-button fray, a certain term slipped into the letter likely provides the most potent glimpse into Francis' sweeping intent for the Jubilee as it rolls into motion. His concern for prisoners already well known, in a passage on including the incarcerated in celebrations of the Holy Year, the Pope writes that, from its earliest roots, "the Jubilee Year has always constituted an opportunity for great amnesty, which is intended to include the many people who, despite deserving punishment, have become conscious of the injustice they worked and sincerely wish to re-enter society and make their honest contribution to it. May they all be touched in a tangible way by the mercy of the Father who wants to be close to those who have the greatest need of his forgiveness." And if that's his wish for a civil society he doesn't directly govern, what could ensue in the "ecclesial society" he does suddenly seems all the more uncharted. Suffice it to say, you've been forewarned.... All around, a wild Fall Cycle awaits – buckle up.